During underwater excavation work at Abuqir Bay in Alexandria, an Egyptian-French mission uncovered a gold coin from the Islamic period. 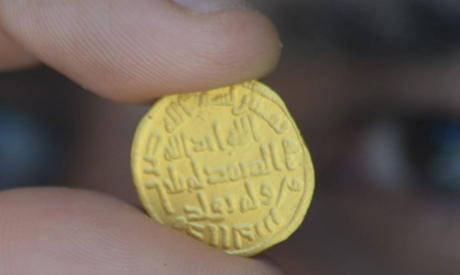 According to Ihab Fahmy, head of the Central Department for Underwater Antiquities, the coin is carved in pure gold and was minted in the Levant in the year 80 according to the Hijri Islamic calendar, during the reign of the Omayyad Sultan Abdel Malek Ibn Marawan. The coin bears a verse from the Quran. Underwater excavation is to continue to reveal more of Abuqir Bay's ancient secrets.